Summer is here, and it’s time to up the ante on your wardrobe selection. While we’re all about the most head-turning runway looks of the season (and certainly have a handful on our current shopping list), it’s imperative that everyone starts with the basics. 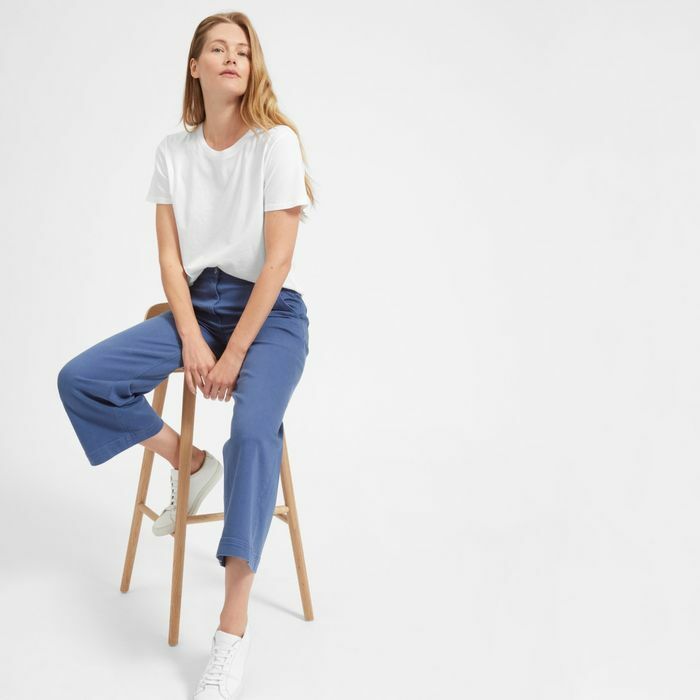 Until you have a mighty band of wardrobe staples as a foundation, you can’t possibly build upon your selection and mix in those to-die-for summer wardrobe essentials, however, they certainly don’t have to be boring. Look out for unique tailoring, exquisite textures, and next-level details that, while timeless, are still eye-catching. Sure, we’re investing in that bright white T-shirt you can wear with everything from jean shorts to silk skirts, we have our eye on a structured bag that will elevate any look, and we definitely want to make sure that we have a classic black leather jacket on hand for those brisk summer evenings. Beyond that, though, we’re looking at slimmer denim silhouettes, pretty patterned one-piece swimsuits we can wear on and off the beach (meet your new favorite bodysuit! ), and the perfect summer sandals that we’ll want to keep in rotation for years to come. With the goal of amassing an arsenal of go-anywhere mix-and-match pieces in mind, here are the seven summer wardrobe essentials that everyone needs. This summer, go for a cropped and boxy fit that hits right at your hip without showing too much skin. You can pair it with everything from high-waisted denim and silk skirts alike that meet right at your waistline. When you’re headed out to a party, a leather jacket is going to be your best friend when it comes to making your floral sundress more cool girl–approved. And with your favorite pair of jeans? You’ll love that buttery soft layer just as much. Available in sizes 12 to 16. Available in French sizes 32 to 42. When we first saw these a few years ago, we dove in head-first, but it quickly became a more head-turning trend with fringe and flare and the like. This summer, pare it back down to the basics with a slim leg that you can wear with a tailored blazer and a T-shirt and still look elevated. Keep it simple this summer with a French bikini that’s both skimpy as well as it is refined. It’s not quite the sporty vibe of a string or an ’80s-inspired one-piece, but it will take you from the South of France to your local pool without a second thought. Top and Rachel Bikini Bottoms ($88) available in sizes XS to L.
Available in French sizes 38 to 44. Forget everything you ever knew about the bodysuit (always a wardrobe staple). This summer, take your one-and-done to the next level with a fun print, like stripes or gingham, by way of a swimsuit. When you pair it with jean shorts or a midi skirt, your friends will be none the wiser. The easiest silhouette in the world to take your wardrobe through morning, noon, and night is the wrap dress. It exudes effortless French-girl style in the easiest way possible and will quickly become the most transitional piece you own as you learn to take it from morning coffee to drinks after work. We’re adding a few more straps to our sandals this summer without going over the top. Think gladiator sandals but with a tailored twist. Gone are the heavy hardware and laces that travel all the way up the leg. Instead, we’re opting for black or tan styles with straps around our toes as well as our ankles. So before you start shopping for those head-turning trends, start with the basics. After all, they‘re among the most important pieces you’ll ever own.